In 1997, while I was enjoying myself grappling with the policy challenges of the power sector, I was abruptly told that I must hand over my charge to an appointed successor – I was the Additional Secretary in the Energy Department, Karnataka – and take command of a tottering public sector undertaking, the Karnataka Agro Industries Corporation, as its Chairperson and Managing Director. I was aghast; but there was no going against the appointment. The Karnataka Agro Industries Corporation, a once proud institution that owed its prominence to the fact that it was a near monopoly provider of fertilizer retailing in the days of regulation, had not made the transition to a liberalized era smoothly. It was on its last legs, a leviathan that could not keep pace with its nimble private sector competitors. My brief was an unpleasant one; I was to close the company down as painlessly as possible. That was not a pleasant task; there were nearly a thousand employees in the company, most of them as middle aged as I am now, but who were unwilling to recognize that their glory days were over. They expected me to wrest back monopolistic contracts from the government, but the best that I could do was to offer them what I thought was a good golden handshake deal. To say that that was not appreciated, is a masterly understatement. But in the rather somber environs of a decaying institution, there was still some sunshine on offer. The Agro Industries Corporation was the majority shareholder in a tripartite joint venture company named the Karnataka Compost Development Corporation (the KCDC), the other shareholders being the Karnataka Cooperative Marketing Federation and the Bangalore City Corporation. 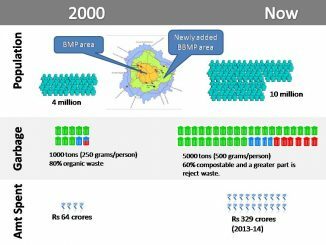 The job of the KCDC was to turn Bangalore city’s garbage into compost, which it sold to farmers and it did a pretty good job at it. The KCDC composting plant was not as smelly or dirty as one would imagine; it was a haven for me; an escape from the travails of dealing with its dying parent. I was fascinated by garbage and its rotting. I devoured anything that had to do with an understanding of rubbish, learning the microbial processes that went on in composting and the techniques of how to accelerate it. Then I chanced upon the larger picture; the garbage collection mafia, how some garbage is really valuable, the corruption that permeates the entire garbage collection and disposal business and the quacks who sell magic remedies to solve the city’s garbage problem. The first thing I realized is that the city’s garbage comprises of a significant quantity, in terms of weight, of mud, dust and construction waste. A lot of it is inert material and was perfectly useless for my business of composting; in fact, it was a distinct disadvantage for my company to accept that kind of rubbish. What I needed was un-adulterated organic rubbish; green waste unsullied by paper, plastic, soil and metal. And that kind of garbage was scarce. In fact, I found that we were being cheated out of such garbage by other privateers, who were in the composting business as well. The best garbage was generated mostly from the city’s wholesale vegetable and fruit markets, and my drivers – we had a few trucks of our own as well – were bribing city road cleaning staff to lay their hands on that good stuff. Food waste was also highly coveted, particularly if it did not have any mixing of animal and meat waste. However, I was unable to get my hands on that; most of the food waste was collected from the large scale generators of waste – the hotels – by piggeries, which sent out their nimble autorickshaws on their collection rounds at night. Once we got our daily dose of good vegetable and fruit waste, we laid them down on concrete platforms that were as large as football fields, where they rotted into brown, odourless compost, in about two months’ time. This was not as simple a task as it sounds. Production was similar to an assembly line and small earth movers constantly shuffled in and out of the day-wise piles, turning them, and ensuring that composting was even. When it rained, our teams of dedicated workers ran around covering the open air platform with plastic sheet, to prevent these piles from getting sodden, which would slow down the composting process. What happens when a giant pile of green organic waste is left to compost? The first thing is that it begins to heat up, as rotting sets in. This first phase, when the compost undergoes rapid, anaerobic decomposition, is similar to fermentation. Increased microbial activity can increase the temperature to as high as 70 degrees. Sometimes this is high enough to ignite inflammable material that might be trapped inside the pile. The high temperature cauterizes the pile and also drives out moisture. Then, when the temperature subsides, the pile of garbage shrinks. This is the time to turn it around and allow for aeration of the compost. Finally, in two months, when the pile is composted, it is sieved to remove metal, plastic and other inert material, before being packed into sacks and sold. We had a long waiting list for our compost. And one of our biggest buyers was a vineyard, who swore by the efficacy of our plum cake like product. Yet, we were not making a great deal of money. There hangs a tale, which I will relate in my next post. This was originally published on Raghunandan’s blog in Accountability India, and has been republished by Citizen Matters with his permission. How is wet waste processed at the KCDC? A few days ago Citizen Matters had reported that the composting firm in the state, Karnataka Compost Development Corporation would be back in action, following the steps taken by the BBMP to solve garbage crisis. Here’s a peek at the composting process in the firm. Now, making arrangement for waste processing facility is compulsory for developers! Apart from making waste management facilities compulsory in new layouts, the High Court also hinted that builders can help BBMP as part of their Corporate Social Responsibility. Hundreds of crores spent on garbage, what does BBMP have to show? The city’s garbage woes did not appear overnight. What led to this tipping point? Citizen Matters looks back over the past 15 years and the current imbroglio in a new in-depth series. Is there an end in sight?